The Jura Giga 5 Super Automatic Espresso Machine is one of the top models available in the market today. Not for the casual coffee drinker, this machine possesses a range of features meant for the serious espresso aficionado! Complete with two separate brewing systems, this model by Jura allows you to brew two different coffee beverages at once. The ceramic bean grinders provide top quality grounds for each and every beverage. The fully programmable nature of this machine makes brewing any beverage as easy as a press of a button. The cost may seem outrageous, but when you consider the capabilities of this machine, it is money well spent. It was even our pleasure to do the Jura Giga 5 review and it’s no doubt a masterpiece. 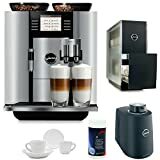 With 2 of everything, the intent was to make it a commercial automatic espresso machine along with something that can be used easily at home too. The Giga 5 provides full beverage customization from two directions. First, there are a full 19 pre programmed specialty coffee brewing choices to select from. These options cover everything from regular coffee to lattes, cappuccinos and even macchiatos. The best part of this full range of choice is that they are only a single press of a button away. The other way that this Jura provides full drink customization is through level choice options. Choose one of three different brew temperatures, as well as one of five different brew strength options. Milk foaming can be set to provide the perfect amount and quality of foam for whatever beverage strikes your fancy. In short, this machine is like having a virtual barista in your own kitchen! The one feature that truly sets the Jura Giga 5 apart from other super automatic machines is the dual brewing system. Two separate brewers allow you to make two different drinks at the same time. In addition, two separate grinders allow you to make two different coffee drinks at once. This allows for complete versatility. Now you can brew a regular cup of coffee on one side, and a world class cappuccino on the other. Ceramic grinders ensure the quality of the grounds, minimizing static and preventing any burned taste from overheated metal grinders. Essentially, this Jura is two top quality brewers in one elegant machine. It comes with with a 15 bar pump, enabling top quality espresso drinks each and every time. A large capacity 87 ounce water reservoir means that you can brew numerous drinks without needing to worry about running out of water. This is particularly beneficial since this machine allows you to brew two coffee drinks simultaneously. The pre-programmed drink options allows for an unprecedented range of coffee drinks at your disposal. Choose from any of 19 different specialty coffee options, each a single press of a button away. TFT display technology allows for easier reading of menus and controls. Additionally, the improved graphics make the display more enjoyable to use, and easier to understand. The double brewing system enables you to brew two beverages at one go. Two separate grinders allow for two different coffee beverages to be brewed at a time. Full programmability allows you to choose temperature, brew strength and even aroma strength in your coffee beverage. Pre-programmed recipes and drink instructions will help you to become a world class barista in no time. The rotary switch makes programming and option selecting quick and easy. Fully automated cleaning programs mean that you don’t ever have to worry about cleaning or maintaining your machine. The cleaning and maintenance of the Jura Giga 5 is completely an automatic process. This covers the whole range of cleaning, from rinsing, to descaling. The machine will perform a thorough rinse after each beverage preparation, ensuring that absolutely all residue is removed. This means that each beverage is made in a virtually new machine. Additionally, after a certain amount of uses, the machine will engage in a more thorough cleaning. This ensures that every component is clean and clear of any residue whatsoever. Finally, an automated descaling program ensures that no calcium or mineral deposits accumulate in the unit. This takes away all of the hassle of having to manually maintain the machine. Furthermore, this eliminates the need to take any of the components apart for any in depth cleaning or maintenance. Now you can enjoy your coffee without having to be a certified coffee machine technician, as is the case with so many other models. Regular external cleanup is quick and simple. The durable, smooth aluminum front and plastic sides are a snap to clean. A damp cloth is all to remove spills and restore the machine to its full glory. The Giga 5 makes cleaning out the coffee grounds extra easy and convenient. The grounds bin is located in the drip tray, and can hold up to 20 beverages worth of grounds. The easy to remove drip tray allows for quick emptying and rinsing. A sensor will alert you when the grounds bin is full and needs to be emptied. Also the Jura Giga 5 parts are also easily available online as well as from the authorized service centers. Normally, a coffee brewing system with so many built in components can be a real problem. This is especially true with regard to grinders, which can be hard to access for cleaning and maintenance. However, this super automatic espresso machine has used top quality components, meaning that maintenance will not be necessary. The ceramic grinders prevent many of the issues that metal grinders experience, such as static and high heat. Furthermore, the fully automated cleaning programs mean that you don’t have to worry about the other components. This machine will take care of itself in virtually every way imaginable and you would not find yourself stuck in Giga 5 troubleshooting problems. The quality of any cup of coffee comes down to the quality of the beans and of the brew system. That said, when you consider the quality of the components used, you are guaranteed success. You could probably make top quality coffee out of wood shavings with this model! Still, don’t do that. Instead, use the best coffee that a machine of this caliber deserves. With complete customization, top quality components, and good temperature control, the Jura Giga 5 will deliver the world’s best coffee, guaranteed! With a 4.1 star rating out of 5 stars, the Jura Giga 5 is fairly capturing the market well overall and this rating will doubtlessly rise after with more purchases. The price point has also some effect in low sales so far, but that is a general thing for a high priced gadget. The high price is also a reason for little bit low rating. But stay assured with this machine as satisfaction will not be a compromise. With top quality components, a luxurious design, and full automation, this machine is in a class of its own. If you require a work of art that creates master espresso beverages, then this is your dream come true!